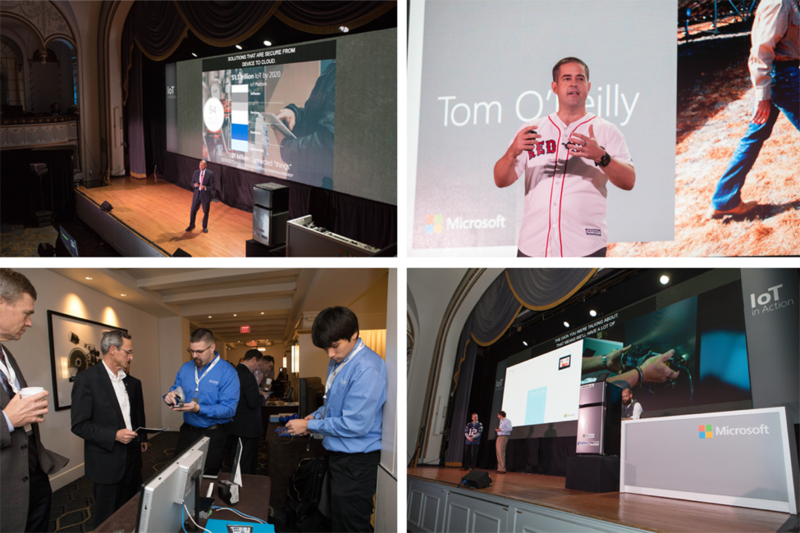 On October 30, 2017, hardware manufacturers, distributors, software vendors, and systems integrators from across the US joined Microsoft at the IoT in Action event in Boston. This event brought together industry leaders for a day full of innovation, education, and collaboration all powered by the Internet of Things. What is IoT in Action? The last conference drew IoT pioneers and thought-leaders from partner companies such as Avnet, Arrow, Advantech, and Tech Data. Together with Microsoft experts and speakers, attendees were engaged in info sessions and panel discussions designed to help companies take advantage of the multi-billion-dollar IoT opportunity. Sessions from the Boston event explored how manufacturers are generating new revenue streams with existing assets and infrastructure, how companies are leveraging IoT to tap market opportunities, and how partners can take an IoT solution from concept to reality. Speakers addressed innovation, challenging the status quo, and transforming business through devices. As mentioned in this IoT in Action recap, a common theme across the event included creating a common language around how we talk about IoT solutions. The event also addressed the key challenges facing IoT innovators, such as scaling solutions, managing the complexities of connecting and monitoring devices in the cloud, and using data for predictive actions that drive business forward. The IoT in Action event also facilitates matchmaking, a component that is critical for success. It used to take between 5 and 7 partners to bring an enterprise-grade solution together. It’s now 20 to 25. Putting companies that want IoT in touch with the right partners is a big focus of the event. If you missed the Boston conference, make plans to attend our next event in San Francisco on February 13, 2018. The day-long event will focus on strategic verticals including energy, retail, industrial automation, smart building, healthcare, and security and surveillance. You’ll have the chance to meet top IoT innovators and get insights around Microsoft technologies, market opportunities, device-to-cloud security, and more that you can apply to your own world-class IoT solution. You’ll also have the opportunity to make valuable connections with representatives across the IoT ecosystem. Check out the full agenda here, and make sure you register early at IoT in Action. Space is limited and you don’t want to miss this opportunity! We’ll also be hosting IoT in Action events in Asia in January 2018. Tune in for our upcoming Tokyo and Seoul events. Are you one of our several IoT partners making waves across these industry verticals? Share your tips for connecting with partners with the Microsoft Partner Community here.